Plumbing has always been a complex thing to understand, even more so when there are things such as ManaBloc manifold. What is the meaning of that ? Before you can even begin talking about ManaBloc manifold, you need to understand more about manifold in general. Manifold itself is a term that is somewhat new and not often used in the plumbing world thanks to its relatively young age. In short, a manifold is something with several openings, where liquids and gasses may enter and flow through it. While it is still young, the manifold has started to gain traction all over the states in the United States of America and all over the world. The manifold, in plumbing term, acts like a sort of ‘connector’ in a water supply line. Take for example that you connect a manifold to a water supply. 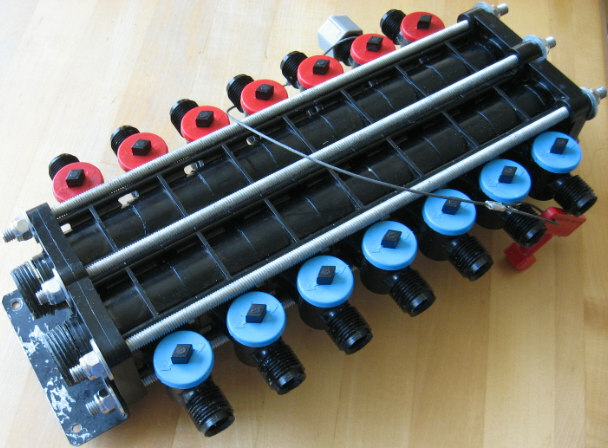 The manifold will then proceed to distribute the water from the supply through plastic pipes or ‘hoses’ connected to it. It is a hub from where the water will gather first before they get distributed to other parts of the house. Normally, manifolds handle hot and cold water. However, there are manifolds that are specifically designed to handle extremely hot water and there are also manifolds that are designed to contain cold water well. Either way, a plumbing manifold will be a fine addition to your house. Why will it be a good addition ? What makes it better than traditional piping ? First thing first, it will be a good addition because of how easy it is to install and to control the water flow using a plumbing manifold. A manifold usually comes with dials on each connected line. These dials serve as a control panel of a sort. If you want to halt the flow of water from a certain faucet, you just need to trace the coloured hose that runs from the manifold to the faucet. When you have found it, closing the flow of water from it is as easy as turning the dial on the manifold. From there, you can then proceed to do the things that necessitate the closing of the water flow. Another thing that makes it better than traditional piping is how durable it is. Copper pipes are vulnerable to rust, and there is no telling how hard it would be to try and fix a leak in such pipe. Manifolds are much more resistant to leaking and the connectors are resistant to rust, meaning that you should not be afraid of having rust develop on them. Sure there are times when you find your Manabloc manifold leaking, but fixing it as easy as replacing the leaking connector with a new one. The manifold in question is the one from Viega, which is aptly named ManaBloc. This manifold right here is a good manifold, especially if you use it in conjunction with other plumbing related utilities from Viega. It comes with an easy-to-read ManaBloc manifold manual, which will be very helpful if you are trying to install it as a raw newbie. Is also easy to get from anywhere, with ManaBloc manifold Canada being very accessible to reach if you are a Canadian. While there are many other manifolds out there that you can buy, the one from Viega is possibly the best one if you are living in the USA or near its vicinity. It works well if you combine it with other utility from Viega and it is durable to boot. You will not be left wanting for more with ManaBloc manifold.